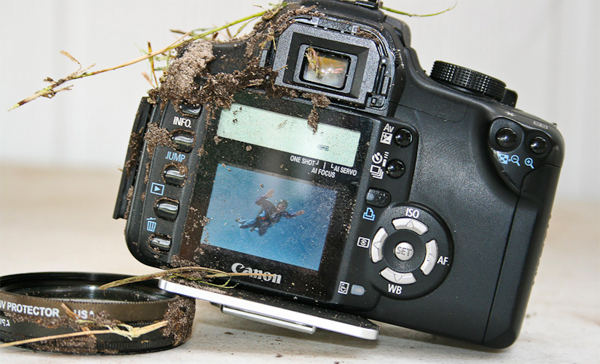 Canon EOS Rebel XT spits in gravity's face, survives 3,000-foot drop? Picture this: you're a skydive instructor with a makeshift helmet apparatus for taking stills and video of your feats. Suddenly, about 3,000 feet from above the ground, your photography mount decides to take its own flight pattern and sets off without you. That apparently happened to a friend of FredMiranda forum member Calin Leucuta, who calculates the velocity at impact was approximately 100 miles per hour. After a 15- to 20-minute search after landing, the video camera was found to be without saving... but the Canon Rebel XT for still was still functional despite a crack in the body and some jerkiness with the zoom lens. We're still hesitant to take it at face value -- it's a pretty wild and impressive tale, after all -- but video is reportedly on the way and we'd definitely like to see that footage remove all lingering doubt from our minds.